E. coli (medical term Escherichia coli) is a type of bacteria commonly found in the human intestines. There are a lot of different types of E. coli, and while many live in the intestine harmlessly, some can cause a variety of serious diseases. How do you get E. coli on holiday? Holidaymakers will carry harmless versions of E. coli in their intestine. The harmful strains that cause profuse diarrhoea and sickness on holiday are usually caught by eating contaminated water or food. Person-to-person transmission is common through the oral-faecal route and the disease is often spread by those who do not wash their hands after visiting the toilet. To avoid getting E. coli from food poisoning on holiday, travellers should avoid eating undercooked meat, especially poorly cooked minced beef, and avoid drinking unpasteurised milk. Holidaymakers should also pay close attention to good hygiene practices, and shouldn’t eat food that should be hot but is served luke warm. What additional steps can I take to avoid E. coli food poisoning on holiday? It is extremely important to wash your hands with soap after visiting the toilet, and before eating meals. Young children should be supervised when washing their hands. You can reduce the risk of getting traveller's diarrhoea by drinking bottled water (ensure the bottle is sealed), and by avoiding ice cubes in drinks. Salads should be avoided unless it is washed in treated water, and fruit eaten only if it can be peeled. Who does the E. coli bacteria affect? Intestinal infections in young children can be particularly severe on holiday, because they cannot tolerate dehydration and blood loss, but all age groups are at risk of traveller's diarrhea. Older people with those with immune system problems are more at risk from the infection. How do you make a claim for compensation following E. coli on Holiday? Holidaymakers are advised to travel with reputable tour operators such as Thomas Cook, Thomson, First Choice, Olympic, etc. as these companies often inspect their hotels to raise hygiene standards. Whilst travelling with one of these tour operators will not guarantee your wellbeing, if you do contract E. coli food poisoning on holiday then you have rights to claim compensation in the UK. The 1992 Package Travel Regulations allow travel lawyers claim compensation on your behalf, but you must have travelled on a regulated package holiday. Travellers thinking of taking a cheap option with fights and accommodation which are individually priced should think twice. These are known as dynamic package holidays. If a holiday was booked through an agent acting for the hotel directly you may have to sue abroad to get compensation. This is not something we advise, and is often a lot more difficult. Can my GP diagnose E. coli food poisoning? E. coli food poisoning can be diagnosed by the detection of E. coli from a stool culture. Infections with some types of E. coli, e.g. E. coli O157, can be very serious. What treatment is necessary for E. coli food poisoning? Intestinal infections caused by E. coli food poisoning on holiday are not usually treated with antibiotics and the majority of treatment involves consuming lots of water to avoid dehydration. Holidaymakers are advised to seek medical advice as to when then can return to work, particularly if they are employed in the food industry or work in hospitals and schools. 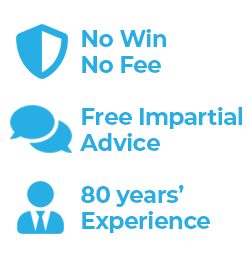 How can Simpson Millar Help? If you are the victim of E. coli food poisoning abroad and your hard saved holiday is ruined as a consequence, contact Simpson Millar LLP’s qualified expert lawyers for free advice. We are likely to be able to act for you on a ‘no win no fee’ basis if you contracted E. coli food poisoning on a package holiday..